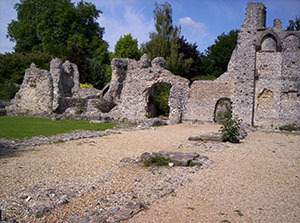 Wolvesey Castle in Winchester, Hants is also known as The Old Bishop's Palace. Now an attractive ruin but it has seen the making of English history! Makes a pleasant hour or two's visit. 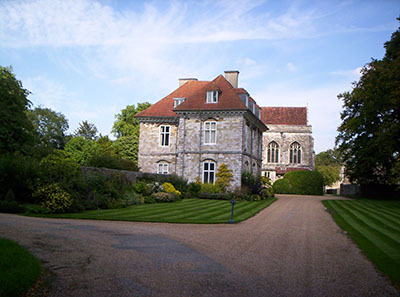 The Castle is another of Winchester's connection with Queen Mary I and Philip of Spain. They dined there on their wedding day in 1554. An earlier royal event causing fuss and feasting was the wedding of King Henry IV and Joan of Navarre in 1402. Today this old structure is looked after by English Heritage. 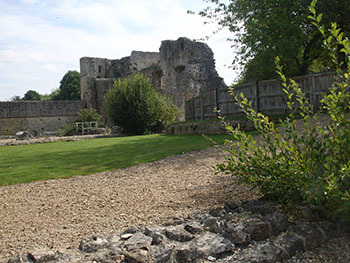 Take a pleasant walk from the bottom of the High Street along the riverside path, past the old city walls, to the Bishop's Palace to visit this gem of a ruin. Delightful spot. A great deal is known about it and English Heritage have informative signs about each area. It was actually a luxurious palace occupied by the powerful Bishops of Winchester. What it must have seen – if only walls could talk!!! Originally built around 1100 it started life as a keep and bailey castle. It was not the first building on the site as there was a Saxon one before that probably made of wood as many were. That it is a ruin is because Oliver Cromwell knocked it about a bit in the English Civil War, the war that waged during 1642 to 1651 between the Royalists and the Roundheads caused a lot of destruction of buildings in England. That the Saxons built the Bishop's Palace here to start with makes a lot of sense. Between the seat of power in the Royal Castle and close to the river. River was important, no taps then, wells were needed!! The attractive house you can see nearby is the wing of an old Baroque house built in the 1600's that has been and still is the residence of the Bishops of Winchester. 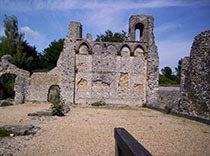 Wolvesey Castle is an English Heritage property. Site is designated hazardous - watch children!